Who can forget the video images from Chopper 5 of tractor trailers spinning hundreds of feet above the ground on April 3, 2012? 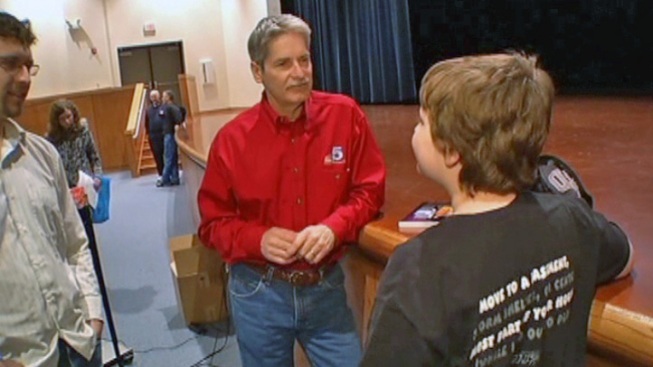 No one in Fort Worth's South Hills High School Auditorium on Saturday could forget. In fact, that's why many showed up. "Texas is one of the states that has a bunch of storms so I think it's important for the public to know how to identify storms and communicate about them," said Clarice Dyson, a high school student in from Frisco who wants to be a storm spotter. "We had people spotting the tornadoes [last April] as they were forming," said NBC 5 Chief Meteorologist David Finfrock. "That's the thing about being in a metropolitan area like this. We've got a lot more eyes on the storms and it helps to have trained eyes." The hundreds of eyes in the auditorium will help tell the rest of the story of the storms, which even the most advanced radar may not pick up right away. We talked to experienced Fort Worth storm spotter Dave Lloyd about that. "There's a very important component in terms of looking underneath the clouds and being able to see things that aren't being seen on radar," says Lloyd. "It's amazing they'll show you clips of radar that don't really look very nefarious but there's actually a tornado in there." It's about recognizing clues in the atmosphere that suggest severe weather is on the way or already here and knowing the difference between what could bring a little thunder, lightning and rain or a potentially killer storm. If you missed today's Storm Spotter class, click on this sentence for the schedule for future sessions. Take NBC 5's million-watt First Alert Radar with you everywhere you go. The NBC 5 First Alert Radar app is available for download free for iPhone, iPad and Android. Search NBC 5 in the App Store or Google Play and download it and rate it today! CLICK HERE for more information.